Posting to MacStories with Workflow. For the past two years, I've been publishing articles and linked posts on MacStories via Python. This inelegant solution was my only option to automate the process of publishing directly from Editorial (most recently, 1Writer): when it comes to writing on iOS, I'm too fussy to accept primitive copy & paste into WordPress' official client. Despite its minimal GUI, crude Python code, and lack of advanced features, my 'Publish to WordPress' script served me well for two years.1 99% of my MacStories articles since late 2013 have been published with it. Still, I knew that something better would come along eventually. When the Workflow team pinged me about a new action they were developing to enable WordPress publishing from the app, I couldn't believe they were considering it. Workflow, an app that I employ on a daily basis to speed up core parts of my job, combined with the single task that powers my entire business – posting new content. It was almost too good to be true. Fortunately, great things do happen in the third-party iOS ecosystem. Today's update to Workflow (version 1.4.2) adds, among more actions, a brand new WordPress action to publish posts and pages to configured WordPress blogs (both wordpress.com and self-hosted ones) and which can be combined with any other existing action or workflow for deeper automaton. After using a beta of this action for the past few weeks, I can say that it's, by far, the best automated publishing workflow I've ever had, and I don't want to go back to anything else. 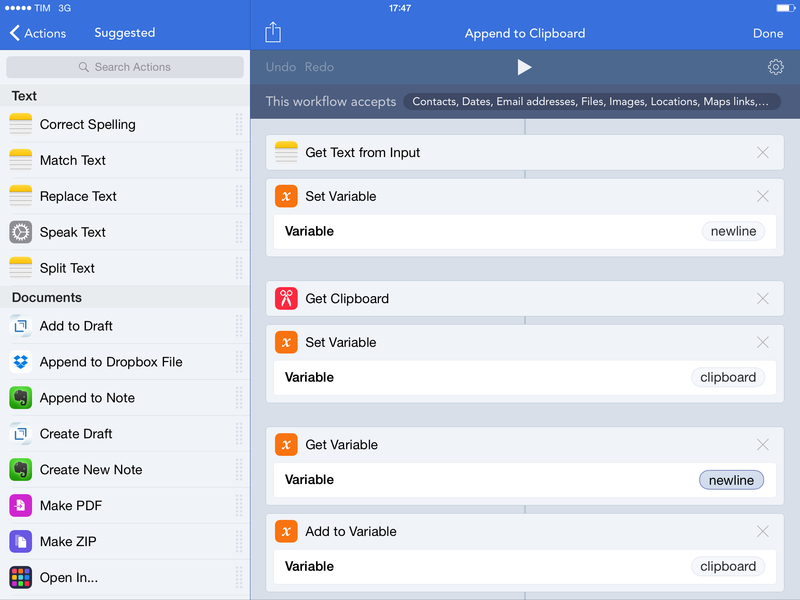 Since its debut on the App Store last year, Workflow has established a new paradigm for automation on iOS. 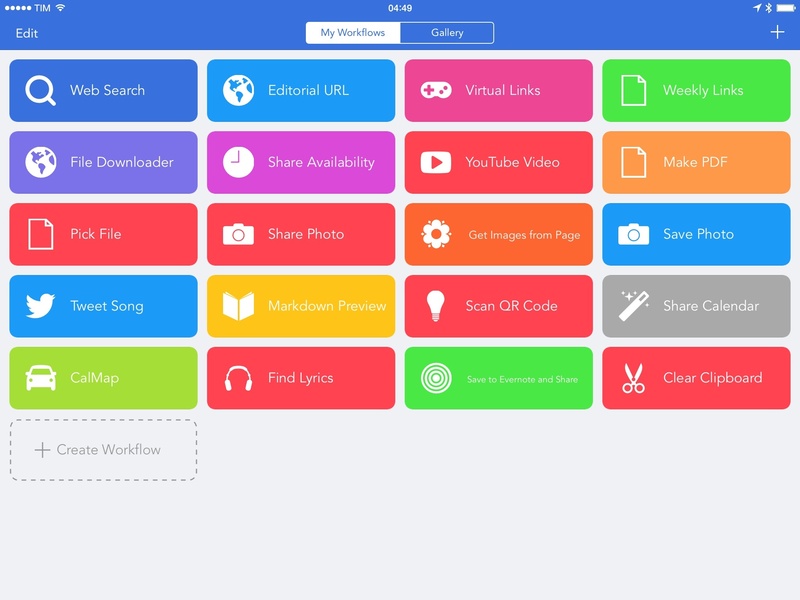 By deeply integrating with iOS apps, device hardware and sensors, an array of web services, and advanced actions for scripting and control flows, Workflow has shown how automation – for many an area of computing that evokes thoughts of old desktop apps and arcane scripting languages – can be reimagined for the iPhone and iPad while being fun and powerful. 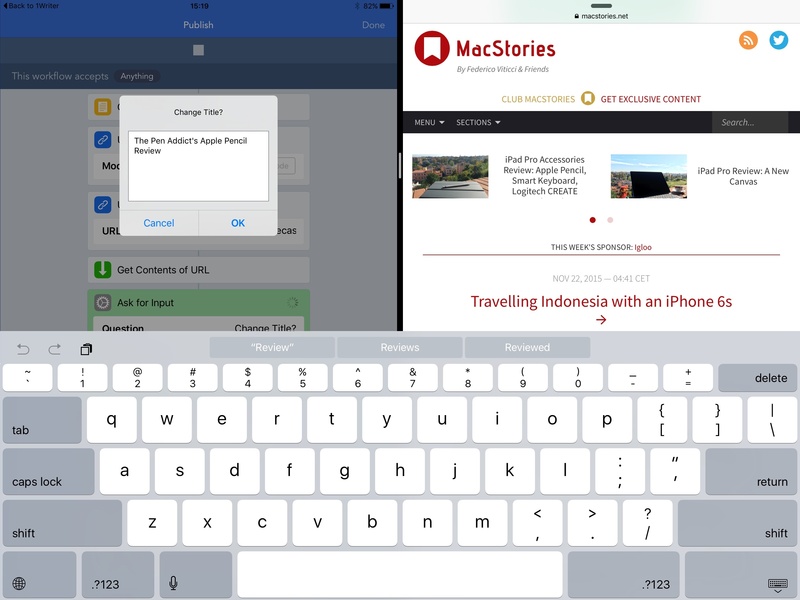 Workflow is one of the reasons behind my decision to go all-in with the iPad as my primary computer, and the Apple Design Award it won in June is testament to the amazing work by the app's young and prolific team. Workflow 1.3, launching today on the App Store, is another major step forward for the app, bringing a powerful Today widget, sync between devices, new Health actions, and more. After reinventing mobile automation by combining an interface reminiscent of Automator with deep integration on iOS, Workflow – one of my favorite apps of 2014 – is coming to Apple Watch. Launching today with version 1.2 of the app, Workflow will allow users to run workflows directly from their wrist, with some new features built to take advantage of communication between the iPhone and Apple Watch. Drafts 4.1.2 has added a new “Run Workflow” action step to provide integration with Workflow app from Desk Connect. 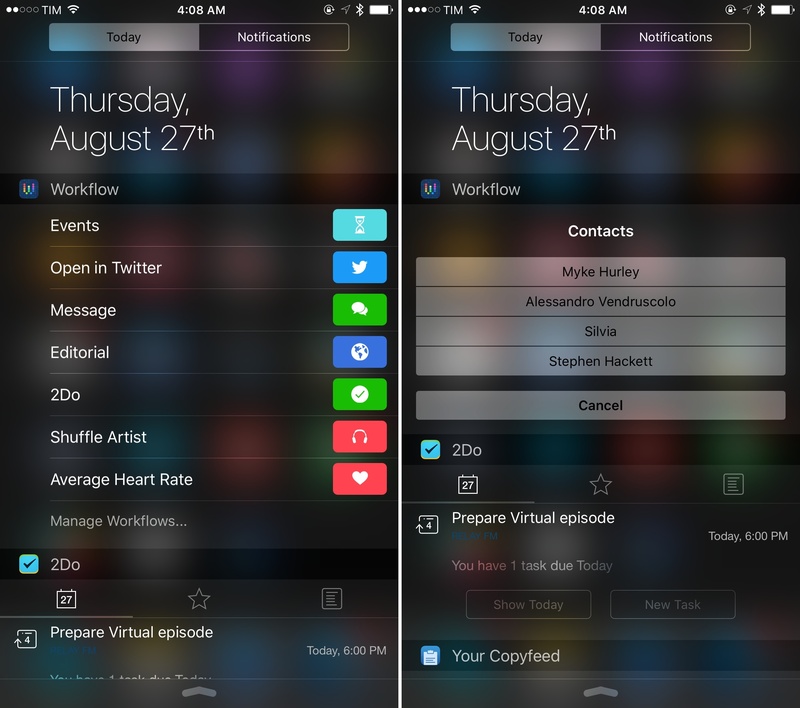 This step makes it easy to fire an workflow in Workflow app with a single tap. The action step can be configured with the name of a workflow, has a template to construct the text sent to the workflow and optional flag for whether to return to Drafts after execution. Under the hood, Drafts is constructing x-callback-url URLs to trigger the workflow, but this makes it much easier for the novice user than constructing them yourself in Open URL action steps. As an added bonus, the latest update of Workflow has added an option, when viewing settings on a workflow, to “Add to Drafts”, which will open Drafts and automatically create an action, setup with a “Run Workflow” action step, ready to go. This feature will be rolling out over the course of the next couple of days, so if you do not see it immediately in Workflow, try again later. For more details, read the Run Workflow action step documentation. I'm using this to quickly send links copied from Twitter (which still doesn't support the iOS 8 share sheet) to Workflow via Drafts, and it works well. Speaking of Drafts, the app is coming to Apple Watch. 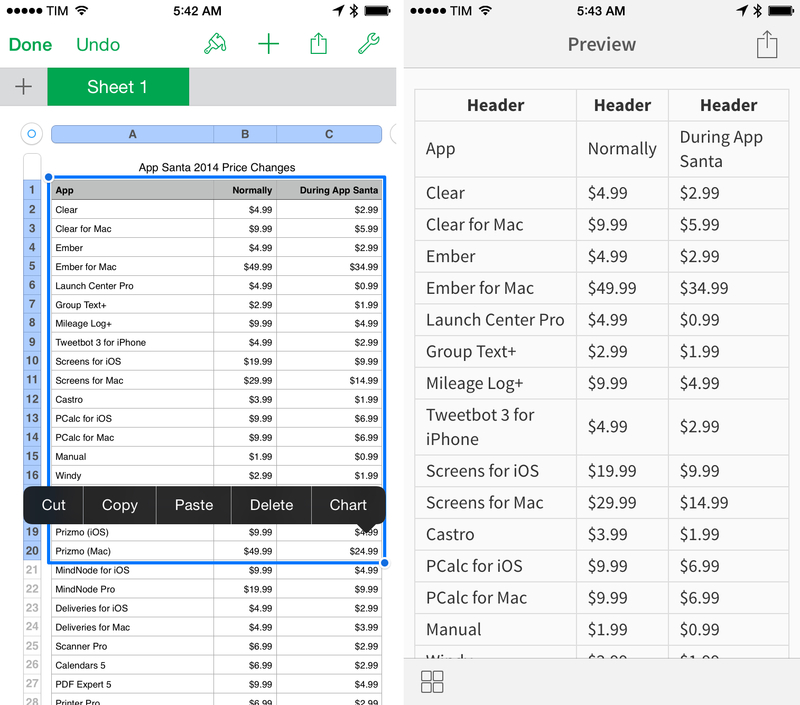 In the years I've spent covering iOS automation, I've often asked for a mobile version of Automator. 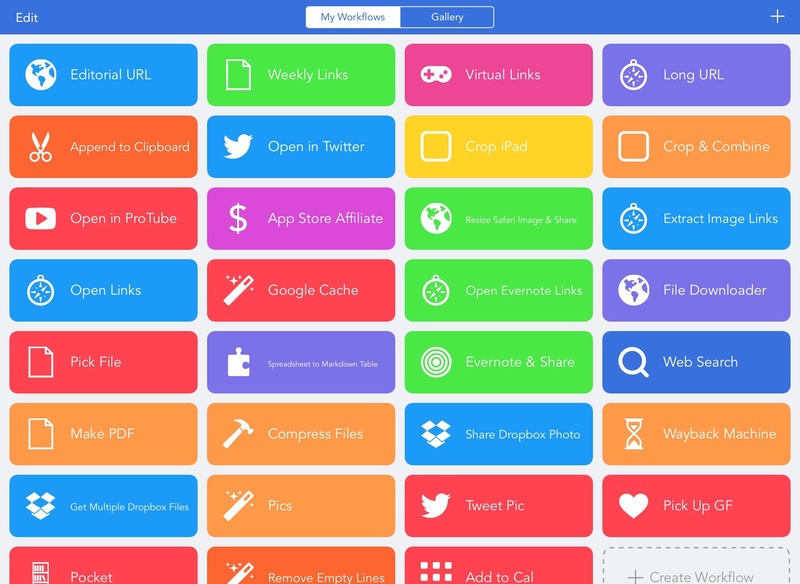 Workflow, released today, tries to bring the deep system integration of Apple's OS X utility to the iPhone and iPad, taking advantage of extensions in iOS 8 to make its automation features ubiquitous and compatible with any app.